As well as being a Manchester City FC flag, this is also a Union Flag variant, in that the red is replaced by a sort of light blue, matching the colour of their shirts. The football club's coat of arms is superimposed upon the middle of the flag. 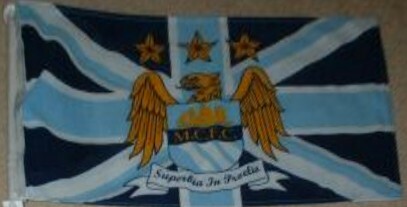 This flag is also sold on Manchester City's official web site at https://shop.mcfc.co.uk.